Favas are a favorite bean all over the Mediterranean, but especially in Italy, where they are used for soups, stews, salads. They can be eaten as fresh shell beans, or left on the plant longer to dry. 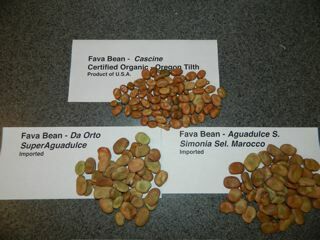 Unlike other beans, which need warm soil and weather to succeed, favas need to be grown in cool weather. Culture. The fava bean is a cool-season annual legume and is usually planted February and March in California for vegetable use and September to November for cover crops. The plant is resistant to frost damage to at least 21 degrees F, so plant as soon as the soil can be worked in early spring. When grown for seed production, the crop takes 4-5 months to mature, depending upon the planting date. Optimum growing temperatures are 70-80 degrees F. Pinch top shoots as plant begins blooming to encourage an earlier and larger crop. They mature in 80-90 days. Plants may require support. Try cutting the plant to 2 inches after harvest. This permits regrowth and a fall harvest. The seeds should be planted about one to two inches deep (large varieties) into well prepared soil, three to five inches apart. Germination takes place in 7 to 14 days. Since they will grow into small bushes, the sprouted seeds should be thinned to 8 to l0 inches apart (this may not be practical), allowing two to three feet between rows for seed production. Diseases and pests. Avoid working in the bean patch when foliage is wet. This limits disease spread. Over fertilization may foster mold disease infection. Rotating beans with other vegetables reduces buildup of soil-borne root diseases. Black aphids prefer fava beans, but pinching the top shoots as the plant begins blooming discourages black aphids that favor the soft, top growth. Harvest, use and storage. Select the pods when they are green, thick and have a glossy sheen. These should be well filled with large beans. The raw bean can then be kept in the refrigerator for a day or two. For preparation to cook, remove beans from the pods and then hull the beans. The hull is the thin outercoat (pericarp) around each seed. Beans can then be cooked in boiling salted water for 20-25 minutes in a covered saucepan. Savory herb also makes a good addition. Other methods of preparation similar to lima beans are satisfactory. Also, young, fresh fava beans can be cooked without hulling.